Being a creative professional in design, in development, in creating things in general, it is absolutely necessary to stay organized. I personally have tried dozens of tools to help me stay that way. But all of them fell short in one way or the other, or even altogether. Lately I’ve been using a combination of Trello and Wunderlist, but couldn’t get satisfied either. I need to keep track of editorial projects and tasks assigned to myself as well as to authors around the globe. Additionally I need to keep track of entrepreneurial tasks in terms of business development large-scale as well as broken down to tiny details. I need a solution that is able to offer me a combination of project, task and file management with the possibility of communicating with team members while observing the statuses of assigned tasks in more detail than “done” or “not done”. With Trello it is easy to create a modern kind of BBS, with boards and lists and cards, where the structure isn’t set in stone. You can adapt the solution to a variety of use-cases. In our case, we have a board for each author, lists for each possible status of an article and a card for each article. The cards wander from list to list until they reach the final list named “Published”. Communication takes place on each card directly and leads to an asynchronous conversation which is kept right where it should be, at the very article talked about. Screenshots and other files can be uploaded to each card if necessary. Due dates can be added as well as list items or even votes. While this is quite an interesting way to manage an editorial team, the larger the team gets, the more obvious the shortcomings become. Reporting is a major downside. You don’t get any summaries as to e.g. which articles are overdue or any other facts you’d like to see aggregated. Due dates can easily be pushed back and forth, the status of a task is not tracked, priorities are – if at all – handled using a color bar system, which is freely adaptable to any need. We go for red as high priority down to green, which we define as “done”. This all does work as long as everyone involved takes the definitions seriously and is willing to stick to this way of collaborating. After one year of practice I can say, not enough people actually do and with a rising number of authors and articles, the system starts to turn against me. What I intended to help me get a better and easier overview, turned out to become a hideaway for vital information. Items get overlooked frequently and all in all, I wouldn’t recommend Trello for any serious large-scale project and task management needs out there. To get a better grip of these tasks and projects that need a tighter administration, I added Wunderlist to the setting. This tool is not intended to be a project management solution, but more or less a simple task management. You create lists, which could well represent a project each, and inside these lists you create tasks. With the newer versions of Wunderlist, some essential features, such as commenting on a task, adding files to it and even delegating, got implemented. At first sight, this solution seemed to make for the perfect companion to my Trello workflow. Then I found out, that not all projects are created equal. Wunderlist’s hierarchy turns out to be too strict, similar to that of Trello. In Wunderlist you got a list, a task and a fake sub-tasks functionality, with the latter being the biggest downside. Sub-tasks can be created and marked as done separately, yet this doesn’t lead to anything. There is no progress indicator, a task doesn’t get automatically marked as done when all sub-tasks are done, there is no filtering to help you find “almost done” tasks by the number of their remaining sub-tasks. Wunderlist is not a lot more than a simple todo-list. What made me go for the solution, turned out to not be elaborate enough. Of course, you can make sure you don’t forget to buy onions at the grocery or even organize a birthday party for your pre-schooler, but when it comes to serious work that needs to be done, Wunderlist is not the solution to turn to. Even more so, the pricing for that level of functionality is plain ridiculous. The best thing with Wunderlist is the availability of apps for all relevant platforms, and even those irrelevant, such as Windows Phone, out there. 84kids decided to keep the Springloops core functionality unbloated and to develop independent additions instead. BamBam! will work together flawlessly with Springloops and other new tools by 84kids, namely Chime (time-tracking and invoicing) and Anchor (collaboration wikis). Yet, you need not be a user of the other services, BamBam! does a perfect job on its own. Before we take a look at what BamBam! has to offer in terms of functionality, let us take a look at the pricing. If you are anything like me, pricing can be a pretty rapid deal breaker. Of course might solution x or y be totally worth the price, but if it is out of my budget – and we know, everybody has a lower or higher to deal with – I need not bother to get into it too deep. Teams with more than 10 members pay a lean seven dollars per user and month. Paid plans enjoy priority support, while free users still do get support, only not as fast as the premium customers ;-) To make BamBam! attractive for teams just a little above the ten member limit, a 15 user plan comes at a reduced rate of 70 dollars per month, while 15 multiplied with 7 would have mathematically lead to a price of 105 dollars per month. During registration you are asked to choose a sub-domain of dobambam.com. This is the place where all your projects are set up. This sub-domain equals an account, which is maintained under your username. 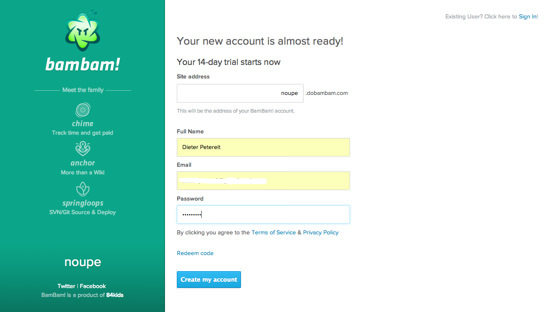 Once registered, you are able to open more accounts under your username from within the backend. BamBam! comes with a clean, modern look. The interface goes with the trend to flat and minimal design. With its small sidebar to the left, it might remind you of well-known mobile apps. Speaking of mobile, BamBam! is usable as well on iOS (tested on an iPad 4) and Android (tested on an S4 and a Galaxy Note 8), yet, does not actually adapt to the sizes and resolutions of mobile clients. This means some work to do for 84kids. 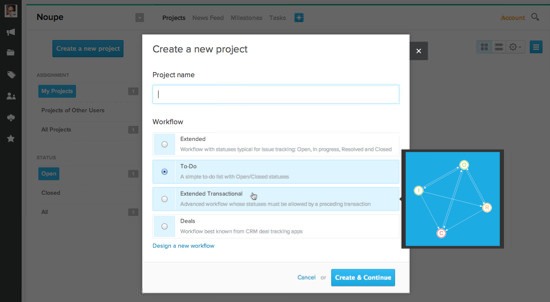 If you decide to create a new project right away, you can do so by hitting the blue “Create a new project” which will open an overlay asking you for a project title as well as a workflow model. Here you are able to choose between pre-defined workflows, which I suppose will fit your needs, or define a workflow by yourself. A workflow defines the way tasks are handled from beginning to end. A solution such as Wunderlist only knows the workflow “To-Do” with tasks being either open or closed. This is available in BamBam!, too. More interesting are the other workflow models. “Extended” offers statuses such as “Open”, “In progress”, “Resolved” and “Closed”, which reminds us of BamBam’s origin as a task module in Springloops. We could as well adjust this terminology to our needs, e.g. “Idea”, “Ordered”, “Researching”, “Writing”, “Ready for Proofreading”,… – you get the point. If your workflow is transactional, e.g. you are planning the building of your dream house, BamBam! has you covered, too. You can set up the whole workflow with tasks beginning only after preceding tasks have ended. And last not least, there is a pre-defined workflow for CRM businesses. From lead to sales, BamBam! supports your team. And then, remember, you can always opt to build up your own workflow model. Compare that to any other solution out there. To get an idea of how BamBam! 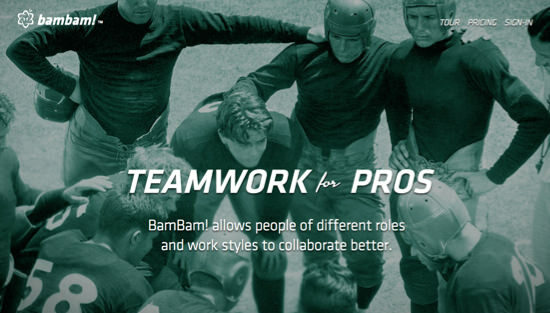 is able to help you, let’s take a look at the content of the project “BamBam! Tutorial”, which sums up pretty much everything the app offers and does a great job in getting you started quickly. First thing you’ll notice is the twitterish stream in the middle of the screen, the so-called News Feed. This stream of information in chronological order keeps you on track of the most recent changes to the project. Each stream item carries a permanent link for easy referral and can be commented upon right from within the stream. 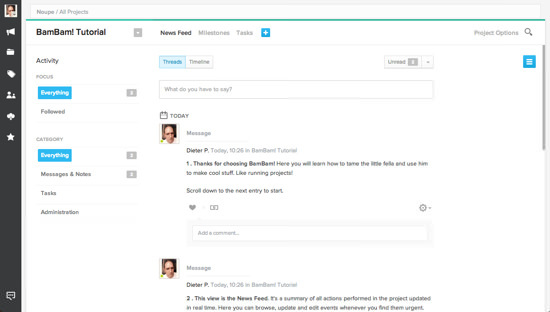 News Feed is available in two flavors, Threads and Timeline. While Threads shows a human readable conversation stream much like that of a forum, Timeline shows a strictly sorted view of what has happened today and in the past. From the top bar you can choose between the most relevant views to your project. Besides the News Feed, you are able to access the Milestones as well as the Tasks. Clicking the big blue plus-button allows you to either create a new milestone or a new task. When it comes down to tasks, BamBam! is hands-down the best solution I’ve come across in many years. I’ve reviewed and used most of what’s available on the market, but cannot remember to have been impressed as much as I am by BamBam! Once you open Tasks from the top bar, a plethora of options becomes available. BamBam! offers loads of filters and views to help you manage even the largest of task lists. 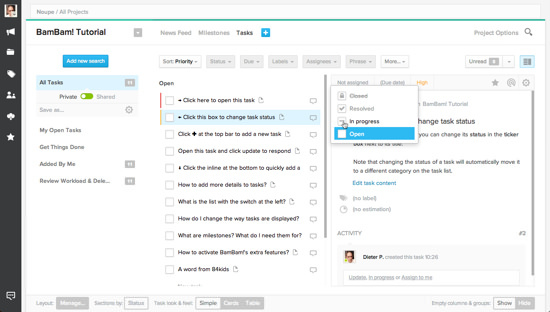 From the row below the top bar you can access tasks by having them sorted by priority, status, assignee and more. You can even enter a search phrase. From the left sidebar you are able to create searches to show you only fractions of all tasks, defined by different parameters. Per default you’ll find searches, which I better like to call “views”, such as “Added By Me”, showing all tasks you added, or “Get Things Done” with all the tasks assigned to you. 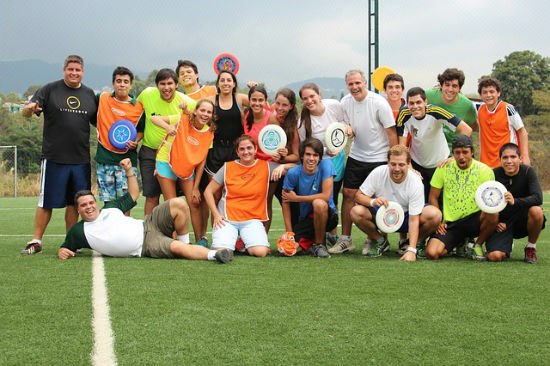 In a team environment, the last view will show its full power. “Review Workload and Delegate” shows all open tasks sorted by assignee and helps you find those people who still have free capacity. If you select a task from the middle part of the screen, a preview pane will open to the right of the list. The task list is sorted depending on the workflow model chosen. In the case of the tutorial it is the workflow “Extended” with statuses such as “In progress” and more. If you don’t want the sorting to be done according to status you can adjust this from the bar below the task list. Choose from the options under “Sections by”. Even if you don’t want any sorting of the list at all, or on the other end of the range, an even more detailed sorting style, you can try the many options under “Layout: Manage” from the very bar I just pointed you to. If you got accustomed to e.g. Trello’s card view of tasks, BamBam! lets you choose this view, too. Simply activate it from the bar below the tasks list. Now let’s take a look at the preview pane of our tasks, which can be shown inline to the right of the list or as a modal in full screen view. I prefer the preview pane right alongside the list. This fits my way of getting things done, you might prefer the other option. Both of us are not forced by BamBam! From inside the preview pane or the modal window, anything related to tasks is at your fingertips. You are able to change the status, assign the task to someone, set a due date and a priority, star the task for easier recognition or follow a task explicitly to be kept updated. Edit the task content, set a label or an estimate on how long it will take to accomplish the task. Change milestones if necessary, add files from your computer and leave a comment. All activity will be attached to the task and is visible to all your team members. That’s about it. Do you miss something? Getting people to participate is as easy as sending an invite from within the project’s main page. Collaborators can be assigned different permissions once they accepted their invitations. Getting tasks into BamBam! can additionally be done using special email addresses. Commands in the email body help add assignees, labels and more. Emails are allowed to carry attachments. If you are still here with me, you must really be interested in the product. Having played around with the service for quite a while now, I decided to give it an honest try as a replacement to my previous solutions. I usually try to avoid this, as changing horses during a running race is always a little hazardous. BamBam! made a lasting impression, though. And I am confident the product will only grow on me the longer I use it. So, what do you expect? If I’ll be using it, why shouldn’t you? Still here? Go there! BamBam looks really cool to me. Working on different products with different tools can be boring at times. Thanks for sharing the tool with us. Feel greatly motivated after reading! These are the points to remind myrself every day before work! :) added to reading list, will re-read once a week! Thanks a lot for the article! Great review! I would like to invite you to try out Bxxxxxx. Most PM tools aren’t built for marketing teams. A few of the things we’re doing differently is a way for agencies to filter projects by clients, involve clients in discussions (without them having to login), an editorial calendar and an easy Kanban style layout that makes more sense for ongoing campaigns that are spread out over stages. I’d love to know what you think about it so do give it a spin! I enjoyed reading your review as we seem to face the same challenges. I have several teams using trello. My background is using MS Project and Primavera (so for big time projects) using PMI methods. Now I run with smaller teams but not much easier to manage distributed teams. I like dobambam for the getchime time reporting. The problem is I found the interface to be way way too confusing! After reading your article I went back and gave it a second try. The problem is the site UI tries to be too modern and fails. There is no visual cues (i.e. no contrast) between different sections of data….everything just blurs together. Just one example in trello the board background is blue, the lists have a grey background, and the cards are white. It is really easy to see what is what. On dobambam you have a thin line that highlights the edge of card… that’s it no other colors or boundaries to tell your eye oh this card is associated with this status and this status belongs to this milestone. It is a visual cue-less mess. I think they tried to out Ivey Jon. I understand not using textures but they have to add some visual cues or I’ll go mad trying to use this. I certainly can’t recommend it to others at this point.